In the Dallas Morning News series Cost of Care, Jim Landers explains how the recent decrease in US Healthcare spending may appear to be good news but the slowdown is really a consolation prize. Compared to developed countries like Germany, people in the US spend as much as 89% more for healthcare. Costs have been a growing problem for over thirty years. A Kaiser Family Foundation study shows that from 1999 to 2014, family health insurance premiums have jumped 212%. The United States is number one when it comes to healthcare spending. The US is also the second fattest country in the world. Regretfully employee wages have not kept up with the US appetite for healthcare and fatty foods. In that same time period wages have only increased by 54%. Landers concludes that the relative high cost of healthcare has forced people to buy health insurance because very few can pay for catastrophic medical care out of pocket. Those out of control cost have also prompted both sides of the political isle to try to regulate health insurance to control the cost of healthcare. Landers points out that the government mandates for everyone to buy health insurance would not be necessary if US healthcare spending was more in line with the rest of the world. Here is the key to his analysis. Greed now drives the system. There are so many people making so much money from healthcare spending that it is now a significant part of US culture. Healthcare spending represents 17.4% of all US spending. Attempts to control healthcare cost by changing the culture have met with a lot of resistance. However both politicians and some healthcare providers realize that the current level of healthcare spending is unsustainable. Since it is not clear what the problem is, consumers are being forced to guide the healthcare market by spending more of their own money. The average health insurance deductible has risen to $1,500. Forcing consumers to spend more of their own money does not appear to translate into shopping for the best price. It makes consumers put off going to the doctor which may cost more in the end. So who is to blame? Cost of Care is a yearlong series that may not only help us see the problems with healthcare but realize some solutions. Landers, Jim. 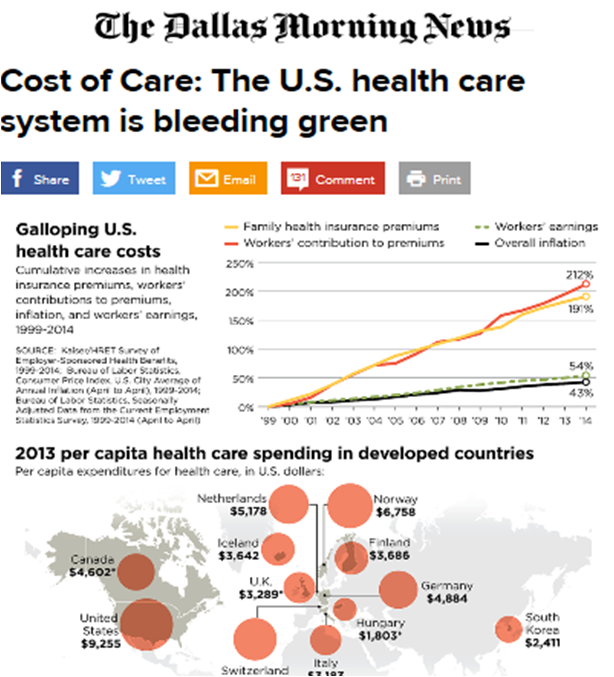 “Cost of Care: The U.S. Health Care System Is Bleeding Green.” The Dallas Morning News 1 Feb. 2015, Metro sec. Print. 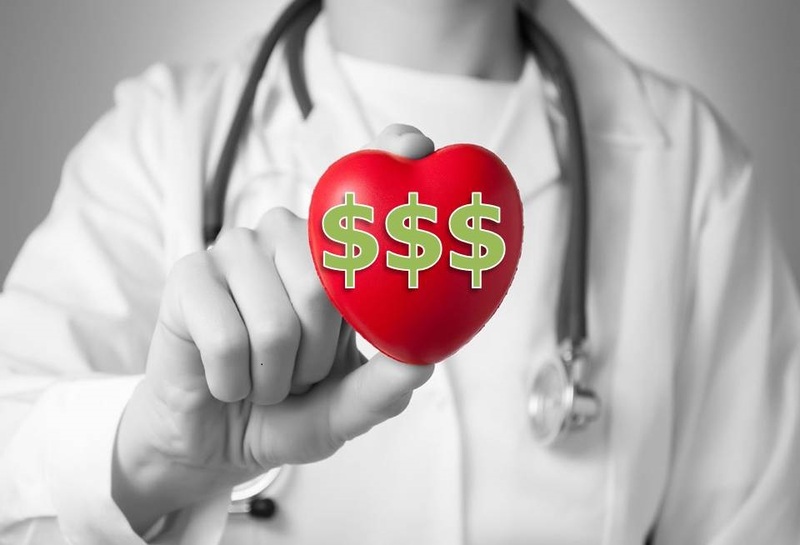 Seven steps to lower your out of pocket medical cost. When you are sick or injured and need to use your insurance, understanding the benefits and out of pocket cost can be very frustrating. There are so many people involved in the medical care process that it is easy to become overwhelmed. Here are seven simple steps to help you navigate the care and payment process. 1. Is your doctor still in your network? Every time you go to your doctor, the first question is “has your insurance changed?” When you set your appointment, you should ask if your doctor still accepts your insurance plan. 2. Is the lab your doctor uses in your network? Most doctor visits will involve some sort of lab test. Check with your insurance carrier to see if they have a preferred laboratory facility. This can save you hundreds of dollars. If your doctor takes specimens in their office, ask which lab they use. If it’s it not a preferred lab with your insurance carrier, request that a preferred lab be used. Laboratory costs are not usually covered by office charges. Know before you go to save a lot of money. 3. Are you getting the best prices on medications? Pharmacy cost is one of the most significant expenses to medical care. However most people don’t inquire about the medication cost unless they are paying the actual price of the medication. It is worth your time to find the lowest price for a medication. Controlling your cost will not only benefit you now, but it will help keep the cost down on your health insurance plan in the future. One of the best sources for finding the lowest cost prescription drugs in your area is www.goodrx.com There is an app available for this service as well. 4. If you need imaging test (MRI, X-ray, CT, etc) are you shopping? The price difference for imaging is astounding, as much as 100% difference from one location to the next. If location is important to you and you have time, scout out the location on Google maps. Most locations will offer a street view with the map. 5. If you need outpatient or inpatient procedure is the surgery center in network? Doctors work at a variety of different centers for surgery. After speaking with the doctors representative for payment arrangements, it is important to contact the surgery center and inquire about their network status. 6. Is the anesthesiologist in the network? Your doctor or the surgery center will be able to tell you who the anesthesiologist is and help you determine if they are in our network or not. Remember if they are out of your network, you are responsible for 100% of what your insurance carrier will not pay. That cost difference may be substantial so it’s worth the extra effort to check. 7. Do you need to shop for durable medical equipment (crutches, slings, special recovery items such as a Cryo Cuff). Many surgical procedures will require special durable medical equipment. Most doctors require the patient to make arrangement and payment for durable medical equipment prior to surgery. Two questions for the supply center is do they offer a network discount and will they allow equipment not used after the surgery to be returned and credited to your account. Healthcare cost tends to follow the 80/20 rule. Eighty percent of the cost of healthcare can be attributed to twenty percent of those that are insured. So if you are in that twenty percent population that is using hospital care, it would be in your best interest to try to control your cost. The seven steps listed could save you thousands of dollars and a lot of grief.